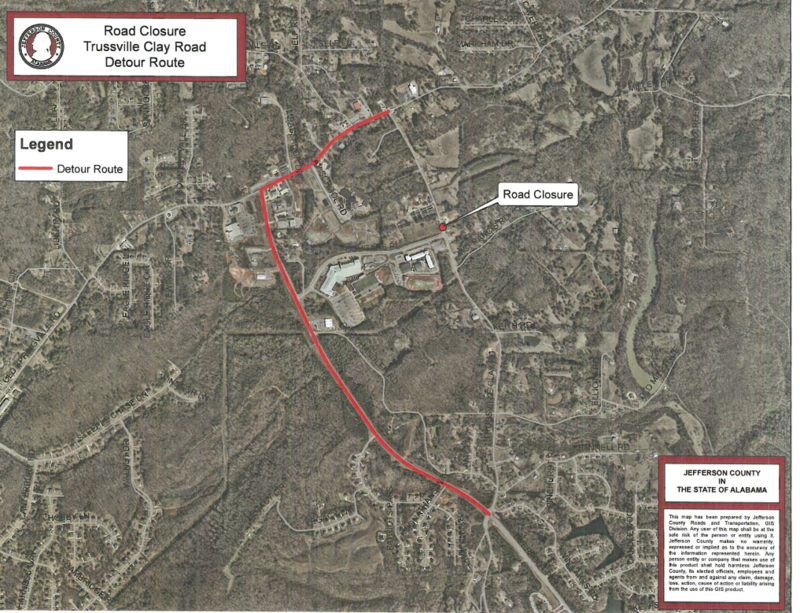 TRUSSVILLE — The Jefferson County Department of Roads and Transportation will temporarily close Trussville Clay Road between Old Springville Road and McFrancis Road to remove and replace a drainage culvert located at 6778 Trussville Clay Road, beginning at noon on Feb. 8 through 9 p.m. on Feb. 9. Completion of the project within this timeframe depends on the weather. Signs notifying the public of the temporary road closure will be posted one week prior to construction. The city of Clay and the 911 Center will be notified of the temporary closure in advance of the road work starting. A map of the detour route and project updates can be found at www.jeffcoonline.jccal.org and by following @JeffersonCountyAL on Facebook and @jeffcotoday on Twitter. All detour routes, traffic control signs and barricades will be installed and maintained in accordance with the Federal Manual on Uniform Traffic Control Devices.